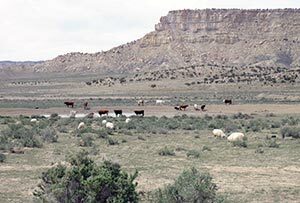 TOP: The twin broad valleys of Blue Gap/Tachee are perfect for grazing, and you will find beautiful ranches here, including some that raise the traditional Navajo churro sheep. BOTTOM: This homestead sits right against a mesa where uranium was mined for several years. Chapter officials worry that wind and rain are bringing contaminated tailings down to the valley floor. I f Blue Gap/Tachee Chapter had a motto, it might be, "Hey! We're here too!" Like the gifted child the parents ignore because they can, this little chapter in the middle of the rez has just been counted upon to take care of itself. For the most part, it has. Its twin broad, flat valleys, watered by runoff from the low mesas that surround them, are perfect for grazing, and some prosperous ranches have grown up here. Coal, uranium and gravel were mined on top of the rocky plateaus. But now the mines are closed, and the chapter is left with radioactive tailings piles alarmingly close to pastures and houses, and it seems no one is willing to help. "You hear about uranium in Cove, you hear about uranium in Western Agency, you hear about uranium in Church Rock, you hear about uranium in Shiprock," said Chapter President Aaron Yazzie. "You never hear about uranium in Blue Gap. We scream and cry, but no one is listening. Chris Shuey (of Southwest Research and Information Center) is the only one fighting for us." "The Abandoned Mine Lands came out and pushed it into a pile," qualified Vice President Leo Sheppard, "but that just stirred it up and made it worse. You can't take care of it all in one shot." The five or six little mines toward the north end of the valley known as Tachee (Red Water) changed hands a number of times, and every company that owned them is now out of business, Yazzie explained. Name: When this project started the chapter was known as Tachee/Blue Gap, which is why it is reported on now, among the T's. It was recently flipped to avoid confusion with Lechee in Western Agency. 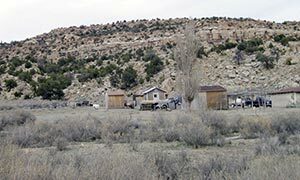 "Blue Gap" is the English translation of "Bis Dootl'’zh’ N’deeshghiizh," "Blue Clay Gap," referring to the gap in the long mesa that separates the two parallel valleys housing the communities of Burnt Corn and Blue Gap. Tachee (Táchii' or "Red Water") is the area on the far north of the eastern valley where a little spring flows crimson red. It is the origin spot of the local branch of the Táchiinii clan. Major clans: Táchii'nii, Tsi'naajnii, Ma'ii Deezhghizhnii, Táneeszahnii. Famous sons and daughters: Long-serving Council delegates Alexander Tso and Tom Lapahie; weaver Marie Burbank Sheppard, who creates rare raised-outline rugs; champion bull rider Julius Y. Begay. Assets: good grazing land, red dog gravel. Issues: bad roads, unremediated uranium mines, lack of employment. "Nobody knows whose job it is to remediate it," he sighed. Meanwhile, radioactive dust blows and washes down the mesa to the valley where on Tuesday you could see a large herd of sheep and cattle grazing. "They glow in the dark," said Yazzie, "and we eat them." Yazzie and Sheppard are both in-laws, confided Accounts Maintenance Specialist Ella Kaye, but people like them. "They care about this community," she said. "They've created an atmosphere of cooperation here. They'll probably have to fire me when this chapter gets certified, since I don't have a degree in this stuff. But I hope they let me stay on, even if I have to clean the chapter house. I like working here." Yazzie must like it too. He's on his third term, and he also directs the chapter's senior citizen center, which on Tuesday was hosting the Stone Cabin Collective's mobile herbal and massage clinic, much to the delight of the local elders. "People say my jobs must be stressful, and they are," Yazzie said. "But I don't feel the stress. I enjoy people, and I love it when I can get them the things they want and need." Yazzie's successive administrations have largely been successful in bringing people the things they need. In 2004, according to the book "Chapter Images," the majority of homes lacked electricity and none had running water; today, nearly everyone has both. On the other hand, he hates it when he can't bring people what they need, and that has been happening a lot lately. People driving on Blue Gap's only paved roads, Navajo Routes 4 and 29, may notice the prosperous-looking ranches frolicking with Easter lambs, but drive with Yazzie on the dirt roads and you'll see some genuine poverty in Blue Gap/Tachee. Tuesday he pulled up at a ramshackle house flanked by two almost new power poles installed during the latest electric line extension. They aren't doing the homeowner any good. "He's obviously not hooked up," said Yazzie. "Look at that power pole." Near the base of the pole were the unmistakable marks of an axe blade. The homeowner had tried to cut down the pole to burn it for firewood. "That's poverty," said Yazzie. "The five hundred dollars we get for housing discretionary funds won't make a dent for this guy." Yazzie campaigned for President Ben Shelly in the last election, but he won't this time around. "I'm waiting for the candidate who will come out here, sit in people's houses, have a cup of coffee with Grandma and Grandpa, and ask them -- in Navajo -- what's on their mind," he said. At the very least, said Yazzie, Window Rock should not stand in the way when the chapters try to do something for themselves. He and Sheppard are still fuming over last November, when they invited Shelly out to show off the chapter's new red dog gravel pit -- and Shelly promptly shut it down. "He said we were out of compliance with the EPA or something," Yazzie said. Sheppard, who's a transportation manager for Navajo County in his day job, was shocked. "That action by the president is something that never should have happened," he said. "He should have said, 'I can see you guys are doing some economic development here. Let me send out somebody from the EPA to walk you through the paperwork so you can make it all legal.'" The chapter, which owns its own graders and other heavy equipment, did manage to repair quite a few of the worst spots in the roads before the president shut down the gravel pit. The brick-red gravel is also quite attractive, and a truckload of it was raked around the chapter house for a nice xeriscape. "Once we get the chapter certified," said Sheppard, "We can fix our roads and then start selling it to people to put around their houses. If we can re-start the mine, that is." Another project on the books, if the chapter can get the Department of Public Safety to sign off, is a police substation. The area is plagued by petty crime simply because it's a 35-minute drive for the police at the Chinle station, and the burglars and vandals know it. "We already have the trailer," said Yazzie. "We just need the MOA." The chapter has also been lobbying Navajo Oil and Gas, which owns the busy Blue Gap Mini-Mart, to put in a Laundromat. Tuesday evening, people could be seen hitchhiking toward Chinle with bags of dirty clothes. The mini-mart already has a small selection of staples and reasonably priced gas, so "once we have a laundry, we won't have to go into town as much," said Kaye. The chapter is also waiting for NTUA to turn on the communications tower it recently installed, which will improve cell reception and Internet connectivity and make it possible for people to set up some cottage industries. Kaye thinks there must be a lot of people like her who would live and work in Blue Gap if they could, and maybe if they can work out of their homes, they will. "I could go and get a job in Phoenix," she mused, "but I love it here. I just drive over the mountain to work. You don't have to pay for everything here, like you do in Phoenix.